I wonder if BC might be one to watch after all. 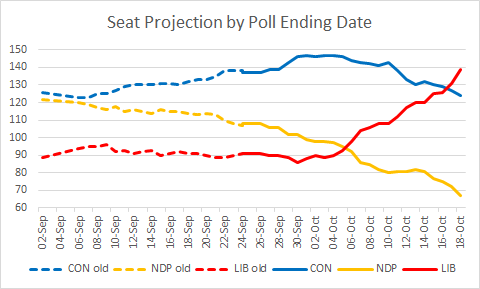 Forum's numbers for BC during the provincial election were the only ones even close to being accurate, so it'd be interesting to see a final poll from it. Like I have said earlier on another post; Quebec will be Cons + Bloc. I see nothing in the latest polls to change my views. BC is a fight between Orange and Blue; Liberals are toast. 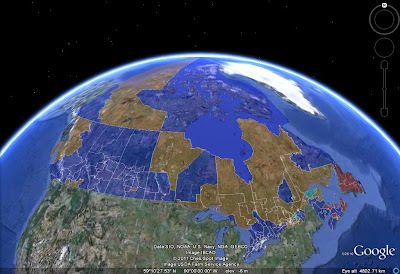 The productive and prosperous regions of Canada are voting for the Cons. Imagine their reactions when perpetual welfare states in the Atlantic provinces give them the Liberal finger. Imagine too how corrupt 'Torontario' mimics the Atlantic region? The final polls of the night are all showing Liberal majority or near-majority, but none of the projection sites seem to be taking it into account. 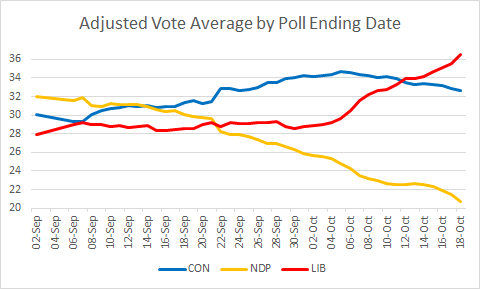 Nanos has released the final poll and its 39.1% Liberals which would be a strong minority, if not a majority. Since Liberal votes are not as efficient, not yet sure. But it seems like people are determined to oust the incumbent. I so hope JT keeps his word and changes first past the post once and for all and we end up with a better and fairer electoral system and especially more representative. Forum has Liberals plus 10, EKOS scrambling to catch up has the Liberals 4+ in front. Mainstream calling for Liberal majority. @Francis: If the Liberal surge has continued after the weekend's polls, a majority is possible. But since the LPC's vote is not very efficient, they probably need to hit 40% for a majority. Only Forum has had them that high (and Forum, on its own poll only, projects a bare majority of 171 seats). @Anonymous 6:57pm: Cuz 1993-2006 was such a terrible time for the country under the Liberals, right? @Anonymous 7:26pm: Yeah, we're already good enough at sapping our own productivity here in BC, with a stupid sales tax system and people voting for gridlock just because people feel that a few executives are getting paid too much.